When you're in need of a Los Angeles plumber to help you repair your toilet, chances are you've got an unexpected emergency on your hands. At TV Plumbing, we provide emergency bathroom plumbing and toilet repair services for our customers throughout Greater Los Angeles. Whether your child has flushed a small object down the drain, or if your toilet is just getting old and less efficient, our certified plumbers have the experience to fix your toilet plumbing problem quickly and affordably. From the obvious to the obscure, we'll identify your toilet problem quickly and provide you with a course of action, including an estimated time frame and a list of necessary parts. 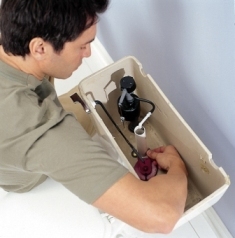 Regardless of what type of toilet you have or what problem may be occurring, if your toilet is clogged or isn't flushing properly, it may be time to call a professional plumber. Call TV Plumbing today, and let us be your go-to plumbing professional in the Los Angeles area. Our trucks are "rolling warehouses", so we don't have to make multiple trips to solve your emergency plumbing problem. We'll fix your plumbing problem fast!